The growth in box office collection of Kedarnath is expected to continue on Sunday, despite challenge from Rajinikanth's 2.0 and Ayushmann Khurrana-starrer Badhai Ho. After a strong opening, Kedarnath has gathered steam at the box office as it entered its first weekend. The Sara Ali Khan-Sushant Singhh Rajput starrer earned Rs 9.75 crore on Saturday, taking its overall box office collection to Rs 17 crore in its second day at the box office. The growth in box office collection of Kedarnath is expected to continue on Sunday, despite challenge from Rajinikanth's 2.0 and Ayushmann Khurrana-starrer Badhai Ho, as both continue to still draw audience to theatres. 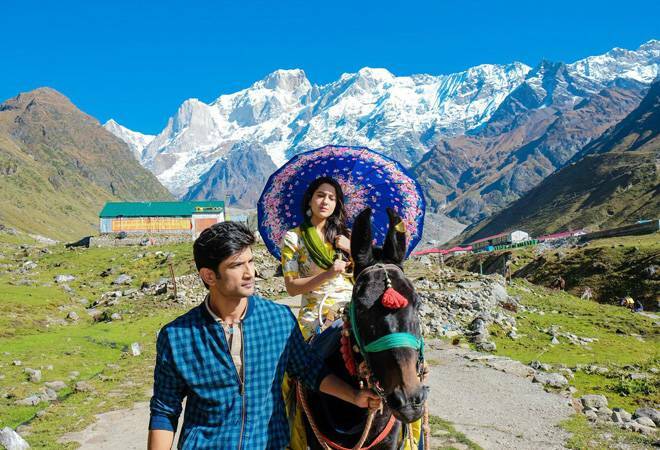 "Kedarnath gathers momentum on Day 2... Growth on Day 2 [vis-a-vis Day 1]: 34.48%... Should witness an upward trend on Day 3 [Sun] as well... Fri 7.25 cr, Sat 9.75 cr. Total: Rs 17 cr. India biz," trade analyst Taran Adarsh wrote on Twitter. Kedarnath marks the beginning of Sara Ali Khan's journey on the silver screen. She has been casted opposite Sushant Singh Rajput. It is a love story in the backdrop of the devastating floods in 2013 which ravaged its namesake shrine town in Uttarakhand. While critics have praised the leading pair for their acting chops, calling it a terrific debut for Sara, the film has been criticised for having a lacklustre story. Kedarnath has been making headlines ever since its trailer came out. The film has drawn flak from priests of the shrine town who have likened it to 'love-jihaad' since it tells a love story between a Muslim porter, played by Sushant and a Hindu pilgrim, portrayed by Sara. A ban has been imposed on the screening of "Kedarnath" in seven districts of Uttarakhand by the order of respective district magistrates in view of protests by Hindu outfits. The film has been banned in Dehradun, Haridwar, Nainital, Udham Singh Nagar, Pauri, Tehri and Almora. The Uttarakhand High Court, while dismissing a PIL seeking a ban on Kedarnath on Thursday, had left it to the discretion of the state government and district administrations.